Ashley began taking yoga classes at her local YMCA in 2004, because she thought yoga would be an ‘easy’ workout. Eight weeks later, she realized it was one of the most challenging things she’d ever done. In 2012, Ashley completed her yoga teacher teacher certification with Jaime Sanchez of West-East Natural Healing. 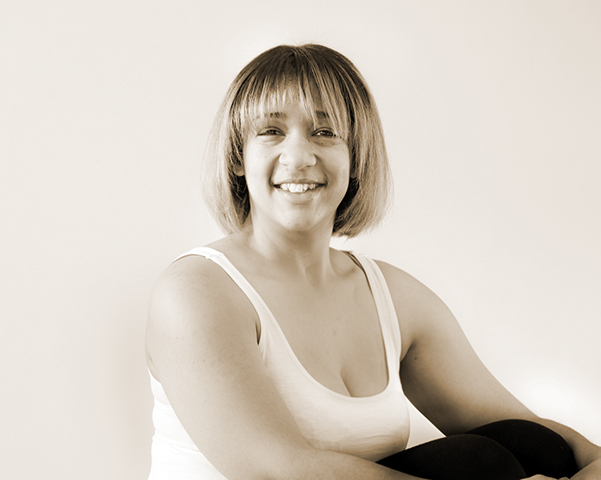 Since then, Ashley has led group and private instruction, with a passion for vinyasa and hip openers. Ashley considers herself to be non-traditional and loves teaching yoga to newbies. She understands yoga can be scary to some, so she welcomes those that want a less traditional approach. You may find Ashley practicing yoga to one of her favorite bands, the Red Hot Chili Peppers. When she’s not on the mat, she’s chasing around her young daughter, 2 dogs, and begging her husband and teenage son to rescue her.